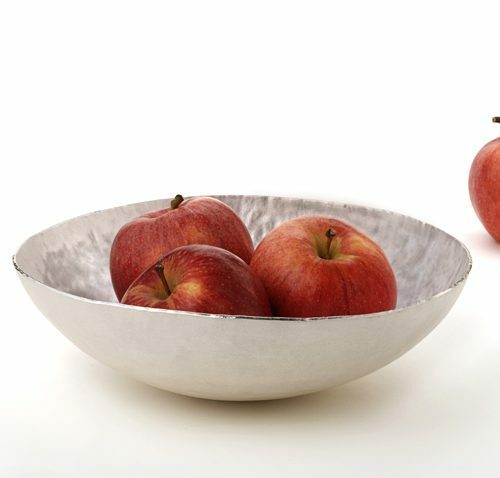 These vessels are from my silversmithing range; I use hammers and mallets to add surface texture and decoration to the pieces, and acid to take the silver surface back to its natural white state. The vessels are constructed to be free standing and off centre, giving them a fluid natural quality. 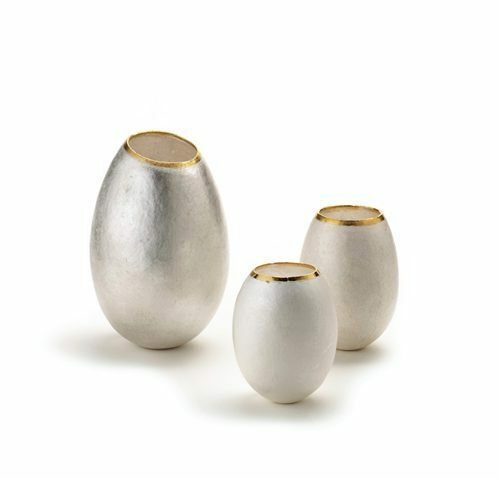 Hand raised from flat sheets of fine silver these lovely egg pod vessels are lightly textured with a raising hammer, and finished off with a stunning 24ct gold edge, these vessels are truly beautiful. 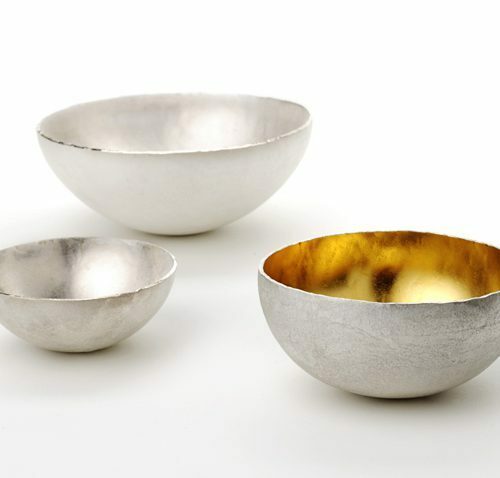 fine silver and 23ct gold plate, 90mm high x 65mm, 70mm high x 55mm and 60mm high x 45mm. 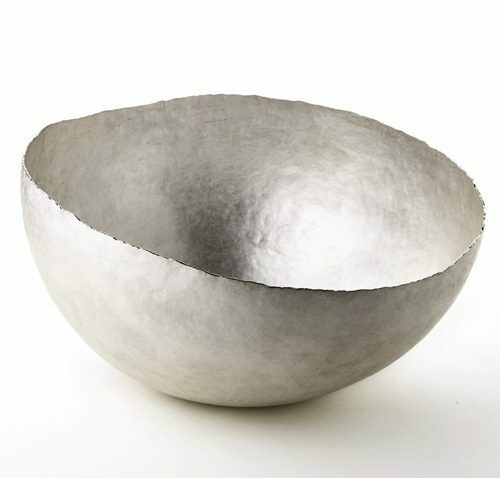 This bowl is from my silversmithing range; I use hammers and mallets to add surface texture and decoration to the pieces, and acid to take the silver surface back to its natural white state. The vessels are constructed to be free standing and off centre, giving them a fluid natural quality. 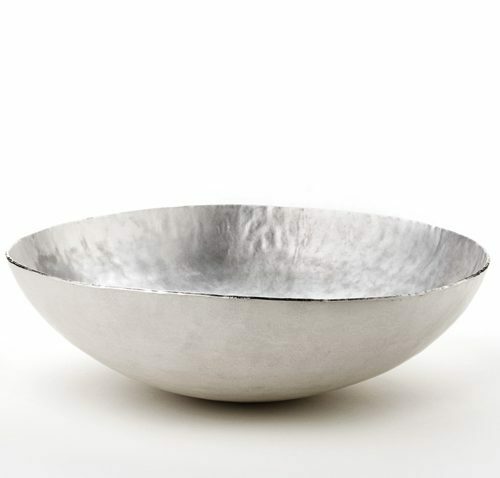 Hand raised from a flat sheet of fine silver this stunning bowl is lightly textured with soft mallet marks, and finished off with a shimmering bright burnished edge, fine silver is a beautiful metal, with purifying qualities, ideal for use with food. 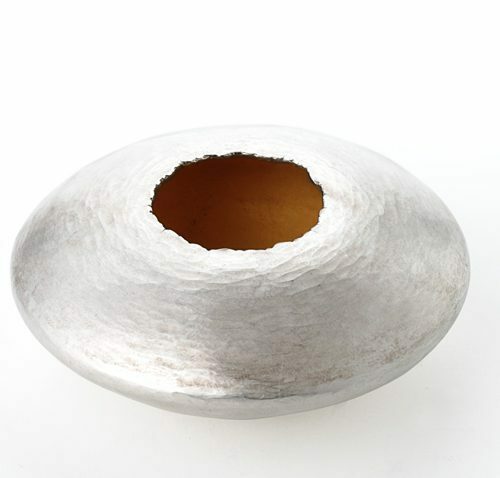 fine silver, 450mm diameter x 180mm high. fine silver, 250mm diameter x 80mm high. 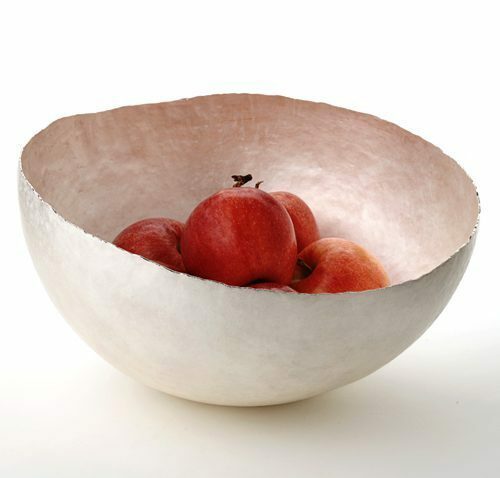 These gum nut vessels are from my silversmithing range; I use hammers and mallets to add surface texture and decoration to the pieces, and acid to take the silver surface back to its natural white state. The vessels are constructed to be free standing and off centre, giving them a fluid natural quality. 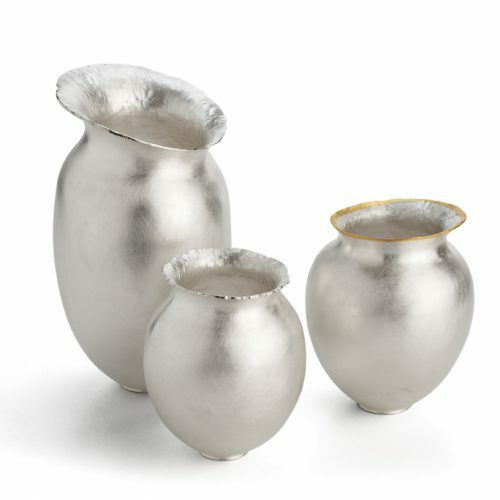 Hand raised from a flat sheet of fine silver these lovely gum nut vessels are heavily textured with a raising hammer, and finished off with a shimmering bright burnished edge, the addition of beautiful ritch gold plate inside, makes a truly beautiful object. 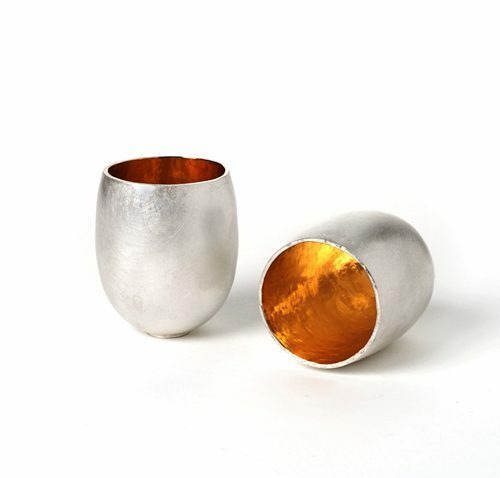 These piece are available with a white silver or oxidised finish. fine silver and 23ct gold plate, 50mm high x 45mm, and 50mm round. 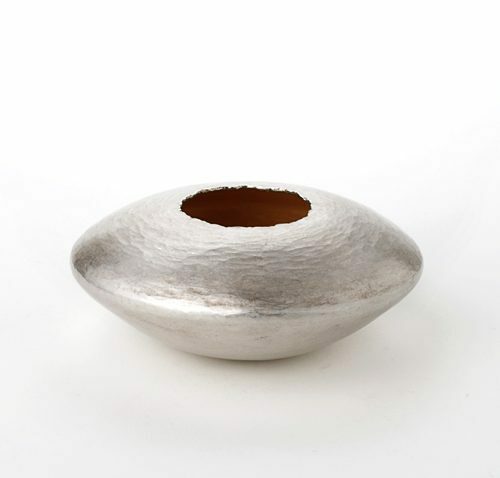 This pebble is from my silversmithing range; I use hammers and mallets to add surface texture and decoration to the pieces, and acid to take the silver surface back to its natural white state. The vessels are constructed to be free standing and off centre, giving them a fluid natural quality. 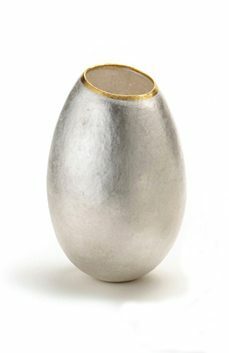 Hand raised from a flat sheet of fine silver this lovely pebble is heavily textured with a raising hammer, and finished off with a shimmering bright burnished edge, the addition of beautiful rich gold plate inside, makes a truly beautiful object. 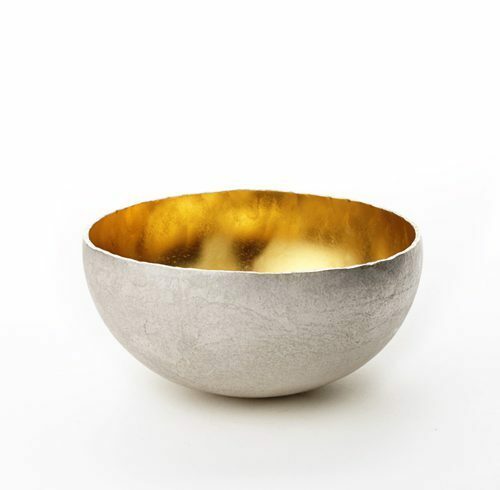 fine silver and 23ct gold plate, 80mm x 50mm. 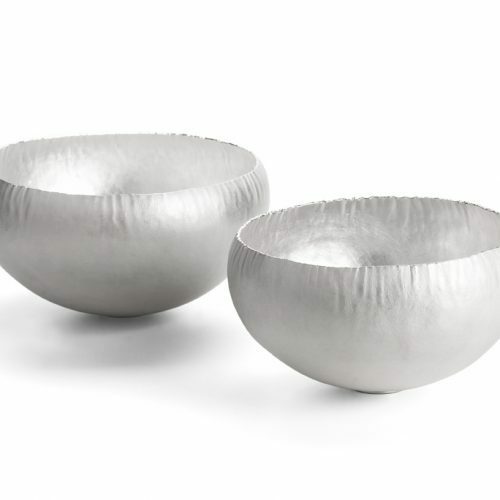 Hand raised from a flat sheet of fine silver these vessels have a tactile bulbous pod like shape, with a lovely smooth finish and finished off with a stunning bright burnished edge, or a beautiful fine gold edge, these vessels are truly beautiful. fine silver, fine gold, 120mm high x 90mm, 80mm high x 60mm and 65mm high x 60mm. 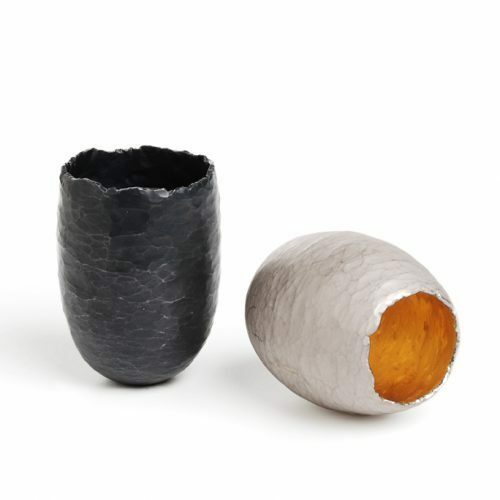 These sake cups are from my silversmithing range; I use hammers and mallets to add surface texture and decoration to the pieces, and acid to take the silver surface back to its natural white state. The vessels are constructed to be free standing and off centre, giving them a fluid natural quality. 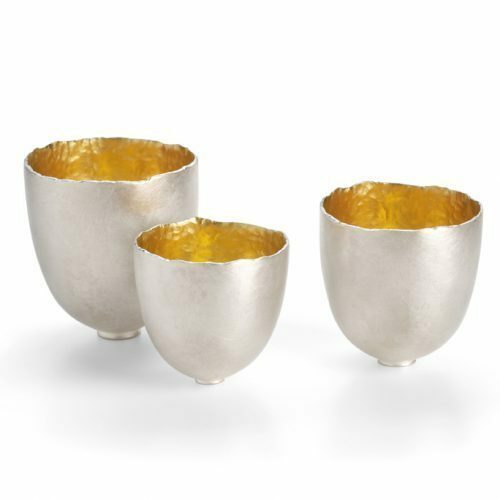 Hand raised from a flat sheet of fine silver these sake cups have a lovely smooth finish, and are finished off with a stunning bright burnished edge, with the addition of beautiful rich gold plate inside, these vessels are truly beautiful. fine silver and 23ct gold plate, 60mm high x 55mm, 50mm high x 45mm and 45mm high x 40mm. 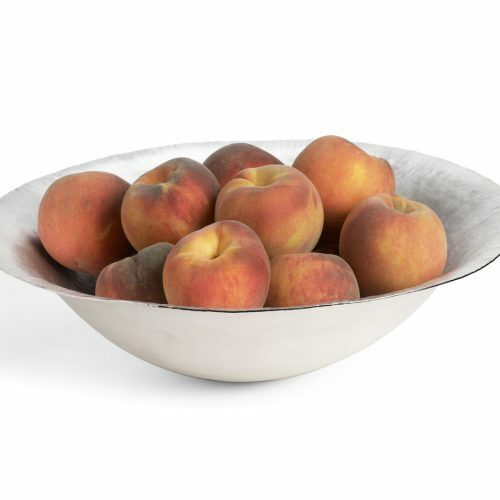 Hand raised from a flat sheet of fine silver these stunning bowls are lightly textured with soft mallet marks, and finished off with a shimmering bright burnished edge, fine silver is a beautiful metal, with purifying qualities, ideal for use with food. 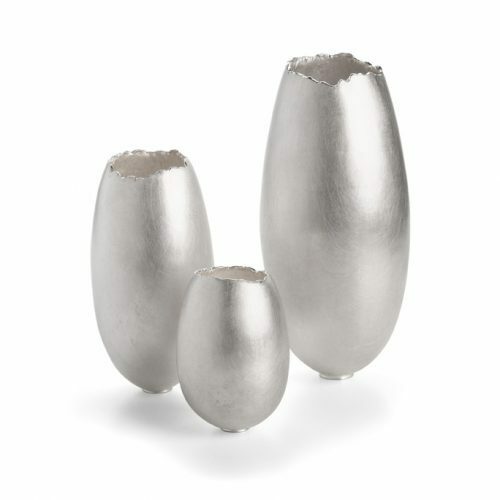 fine silver, 150mm x 90mm and 180mm x 110mm. 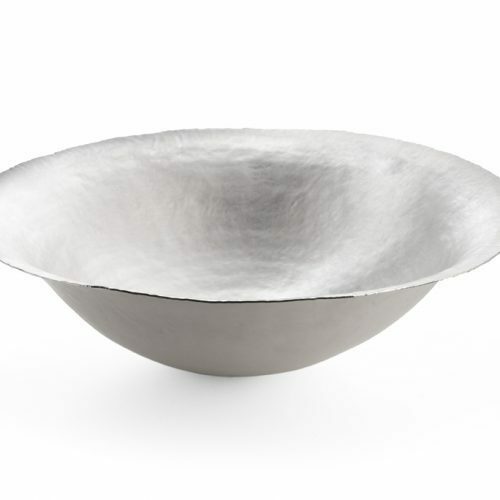 Hand raised from a flat sheet of fine silver these vessels have a tactile elongated egg shape, with a lovely smooth finish, and finished off with a stunning bright burnished edge, these vessels are truly beautiful. fine silver, 110mm high x 55mm, 90mm high x 50mm and 60mm high x 45mm. 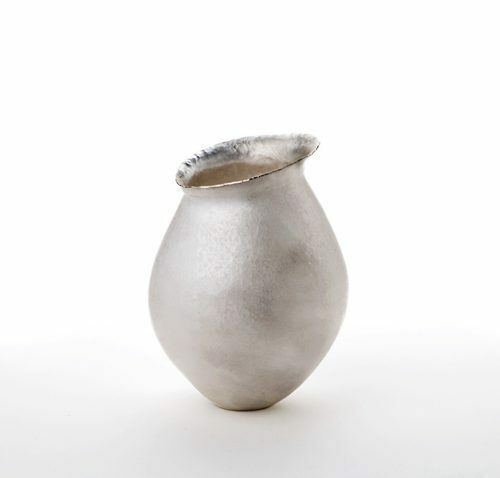 This vase is from my silversmithing range; I create small and large pod vessels, bowls, vases and tableware, which are all hand raised, form flat sheets of metal. I use hammers and mallets to add surface texture and decoration to the pieces, and acid to take the silver surface back to its natural white state. The vessels are constructed to be free standing and off centre, giving them a fluid natural quality. 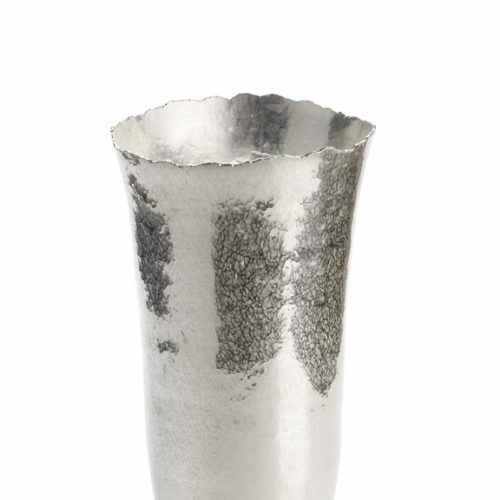 Hand raised from a flat sheet of fine silver this stunning vase is in the form of a tall fluted tulip, beautifully tactile, and lightly textured with soft plannishing hammer marks, and finished off with a stunning bright burnished edge. fine silver, 230mm high x 90mm. 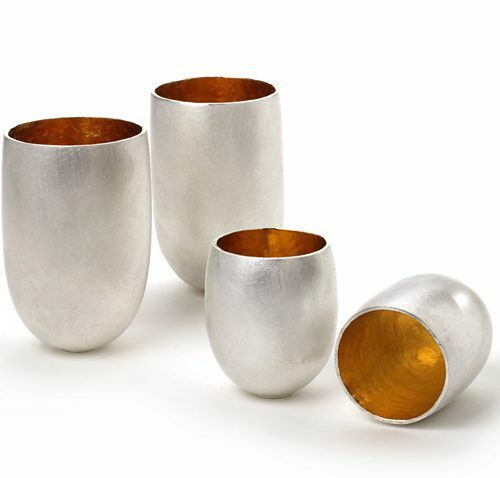 These shots and tumblers are from my silversmithing range; I use hammers and mallets to add surface texture and decoration to the pieces, and acid to take the silver surface back to its natural white state. The vessels are constructed to be free standing and off centre, giving them a fluid natural quality. 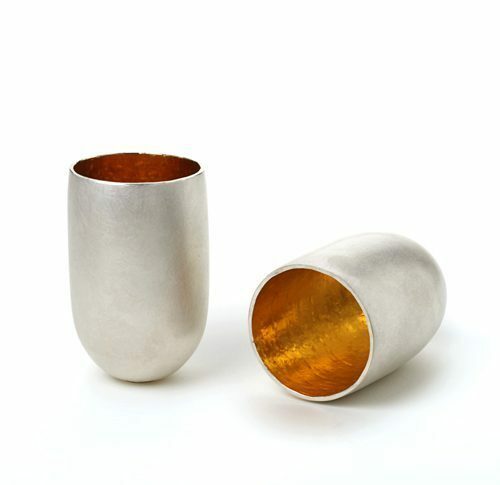 Hand raised from a flat sheet of fine silver these shots and tumblers have a lovely smooth finish, and are finished off with a stunning bright burnished edge, with the addition of beautiful rich gold plate inside, these vessels are truly beautiful. fine silver and 23ct gold plate, 60mm high x 50mm and 45mm high x 40mm. 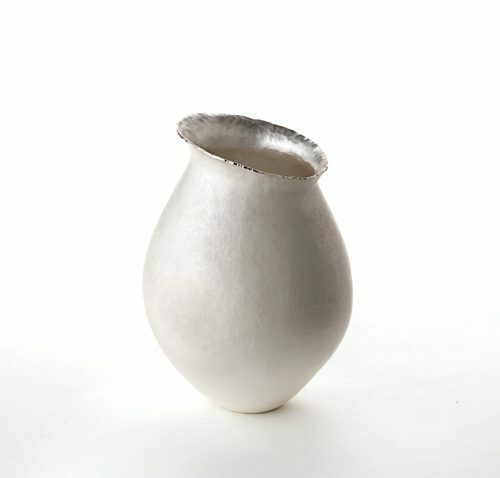 fine silver, 350mm diameter x 220mm high. 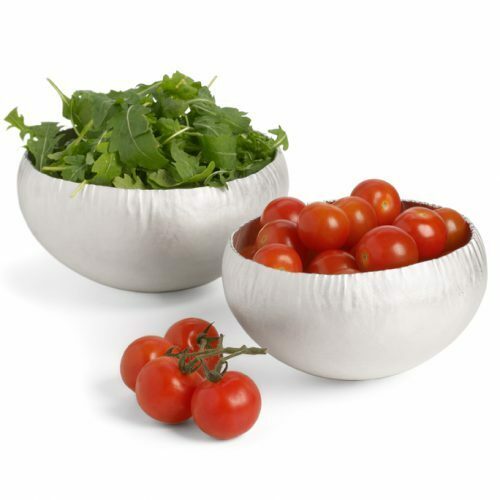 These bowls are from my silversmithing range; I create small and large pod vessels, bowls, vases and tableware, which are all hand raised, form flat sheets of metal. I use hammers and mallets to add surface texture and decoration to the pieces, and acid to take the silver surface back to its natural white state. The vessels are constructed to be free standing and off centre, giving them a fluid natural quality. 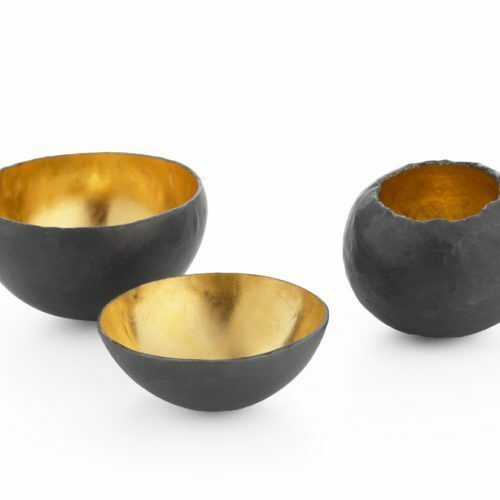 Hand raised from a flat sheet of fine silver these stunning bowls are lightly textured with soft mallet marks, for spectacular contrast these bowls are oxidised, and with the addition of beautiful rich gold plate inside, these bowls are truly beautiful. These napkin rings are from my silversmithing range; I use hammers and mallets to add surface texture and decoration to the pieces, and acid to take the silver surface back to its natural white state. The vessels are constructed to be free standing and off centre, giving them a fluid natural quality. 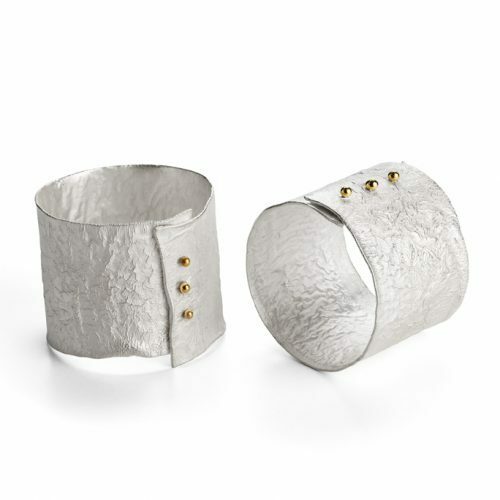 Hand formed from sterling silver sheet, these lovely napkin rings are textured by reticulation, melting the surface of the metal to form a wonderful organic finish, with a shimmering burnished edge, and 3 beautiful gold beads set across the front, they are wonderfully tactile. sterling silver and 18ct gold, 50mm high x 45mm diameter. These spoons are from my silversmithing range; I use hammers and mallets to add surface texture and decoration to the pieces, and acid to take the silver surface back to its natural white state. 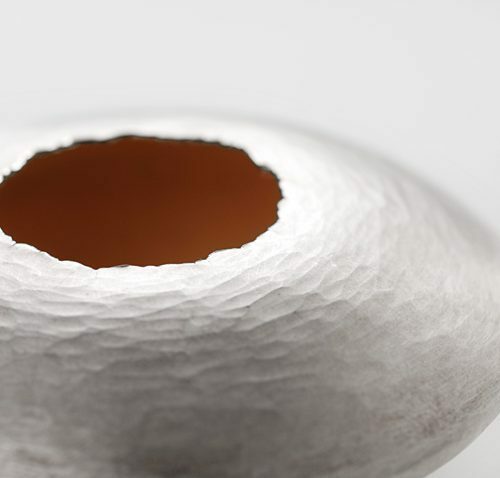 The vessels are constructed to be free standing and off centre, giving them a fluid natural quality. 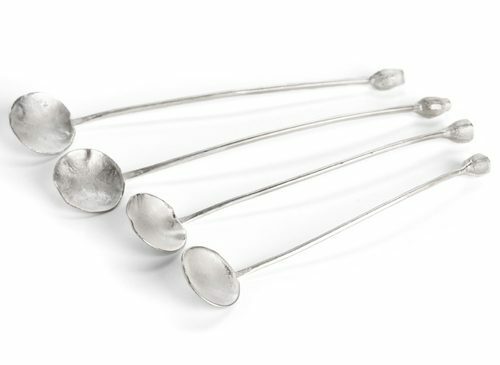 Hand formed sterling silver spoons, with reticulated bowls, long slender handles and finished with a beautiful cast silver gum nut, beautifully simple and elegant.